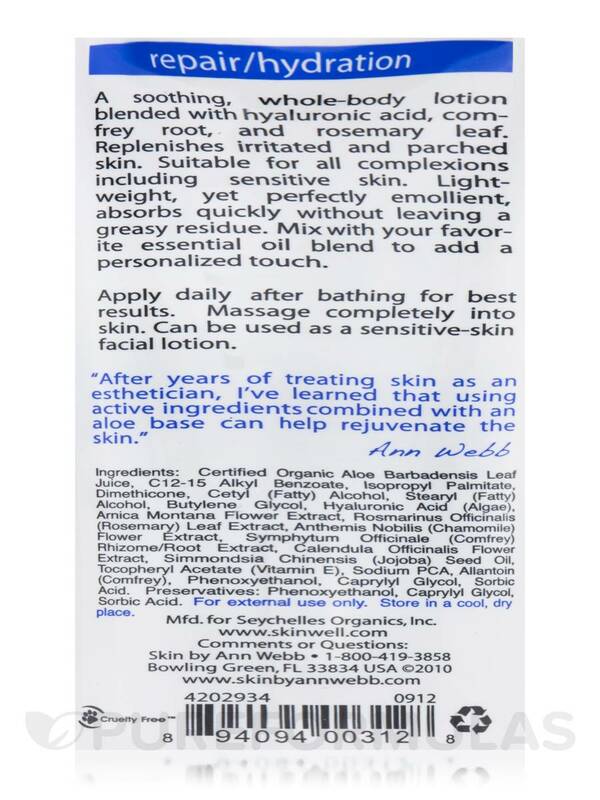 I love the Face & Body Lotion from Skin by Ann Webb! This is lotion as described and not cream, so it is not as thick and not oily. It has no scent at all even at the start. It absorbs nicely. Excellent ingredients. A soothing‚ lightweight‚ hydrating blend designed to replenish all skin types. Certified Organic Aloe Barbadensis Leaf Extract‚ Isopropyl Palmitate‚ Dimethicone‚ Cetyl (Fatty) Alcohol‚ Stearyl (Fatty) Alcohol‚ Butylene Glycol‚ Hyaluronic Acid (Algae)‚ Arnica Montana Flower Extract‚ Rosmarinus Officinalis (Rosemary) Leaf Extract‚ Anthemis Nobilis (Chamomile) Flower Extract‚ Symphytum Officinale (Comfrey) Rhizome/Root Extract‚ Calendula Officinalis Flower Extract‚ Simmondsia Chinensis (Jojoba) Seed Oil‚ Tocopheryl Acetate (Vitamin E)‚ Sodium PCA‚ Allantoin (Comfrey)‚ Phenoxyethanol‚ Caprylyl Glycol‚ Sorbic Acid. (Preservatives: (Phenoxyethanol‚ Sorbic Acid. pH 5.0-6.0). Cruelty-Free / Paraben-Free / Vegan / Vegetarian / Phthalate-Free. Apply daily after bathing for best results. Massage completely into skin. Can be used as a sensitive-skin facial lotion. 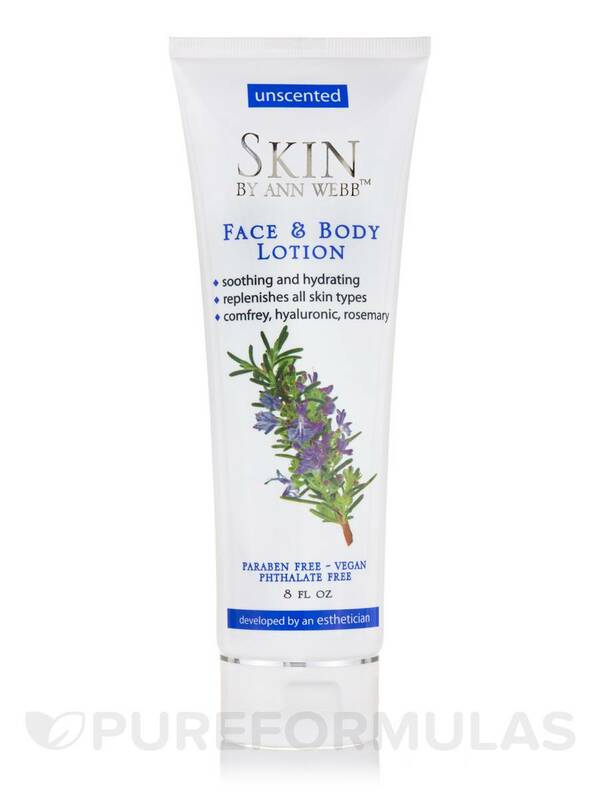 Face & Body Lotion from Skin by Ann Webb texture is close to a thin lotion consistency. It's not thick like the cream version of this product, but it is good enough to moisturize your skin and keep it hydrated. 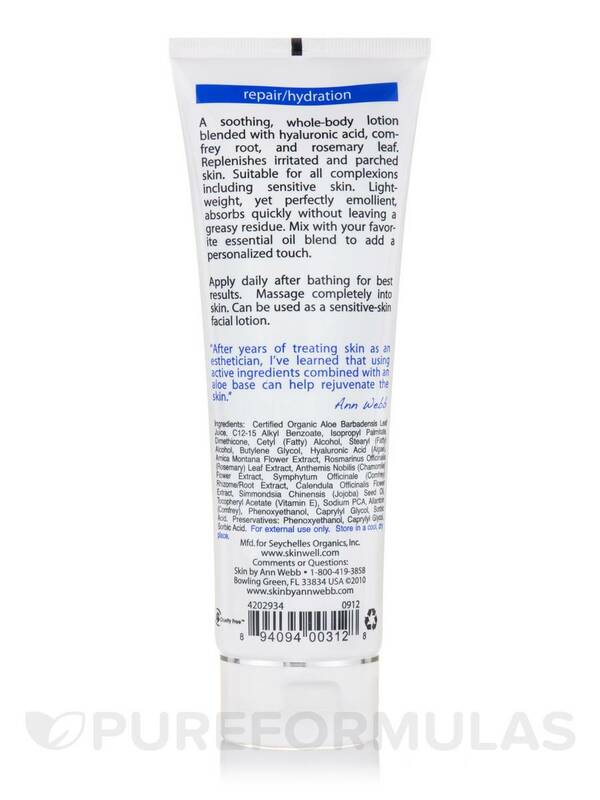 If you have very dry skin, this may not be for you. This does have Dimethicone in it for curious purchasers. The cream version doesn't include dimethicone in their product. For Fall/warmer weather, this is a good option. For harsher climates, go with the cream version. Price for this product is excellent compared to other sites that charge you more. I like the light consistency of this item and how smoothly it goes on. I also like how this product contains dimethicone and it's not super sticky. How it may not be enough to moisturize very dry skin, it is a lotion at the end of the fay, not as heavy as a cream moisturizer. Face & Body Lotion Unscented by Skin by Ann Webb is a good lotion with first ingredient not water but aloe! Does this product contain gluten or any ingredients derived from wheat or oats?